Ignorance Is Bliss is a “more stuff” expansion. Or perhaps a better way of putting it is “alternative stuff.” For example, there are a bunch of new recruit cards and market tiles that you can use as an alternative to the recruits and markets in the original game (they aren’t designed to be mixed together with the original recruits and markets). There’s also a new type of recruit card (not a new faction, just a new type). Ignorance Is Bliss is also a “player count” expansion. 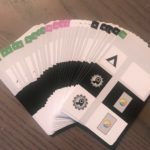 The original game of Euphoria was for 2-6 players, but the expansion adds an Automa mode (an intelligent AI system) that expands the game to 1-6 players. The Automa system is also designed for optional use in 2-player games so they feel more like 4-player games. 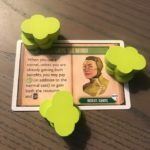 Ignorance Is Bliss is also an “improve the rules” expansion. 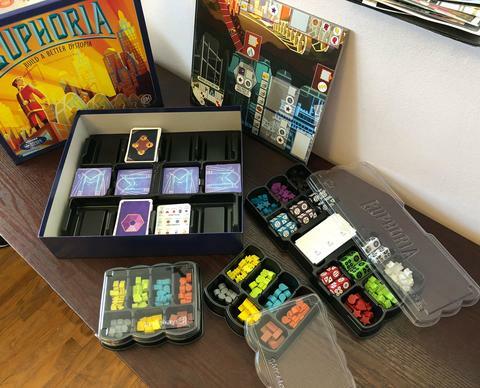 Euphoria itself still stands on its own, but given that it was released 5 years ago, we’ve listened to a lot of feedback about certain frustrations and perceived imbalances, and we’ve addressed them with some new rules, a “New Antiques Bazaar” board, and some new components. What happens if I draw a factionless recruit via my ethical dilemma? You cannot gain a factionless recruit during the game. If you draw factionless recruits (i.e., via your ethical dilemma), discard them and draw replacements. Are there 4 or 8 double-sided faction penalty cards for the Automa? There are 4 cards, not 8. Can I use the New Antiques Bazaar when playing with the original recruits and markets? No, we don’t recommend doing that. “Without” on page 4 of the rules in reference to this should say “with”. 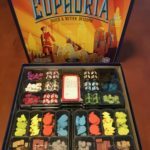 How do I pack the expansion into the Euphoria insert? 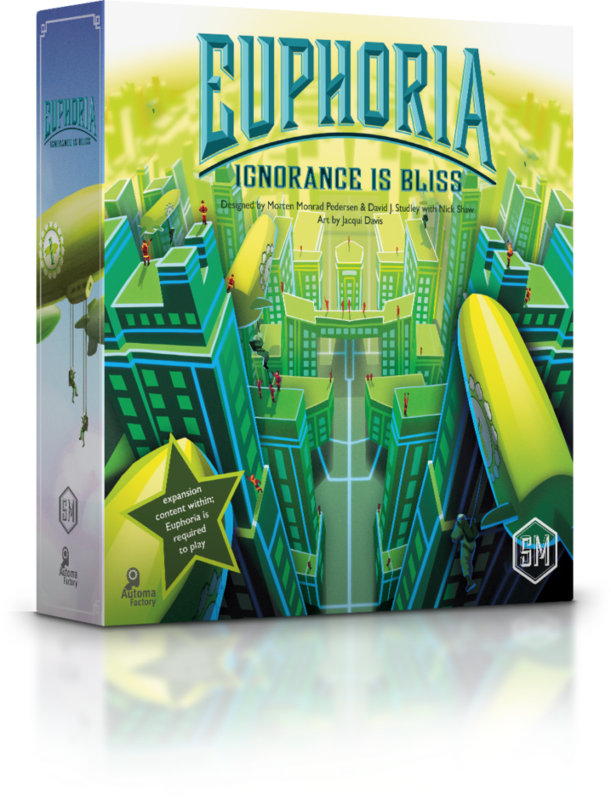 Today we reveal the full rulebook for Euphoria: Ignorance Is Bliss! 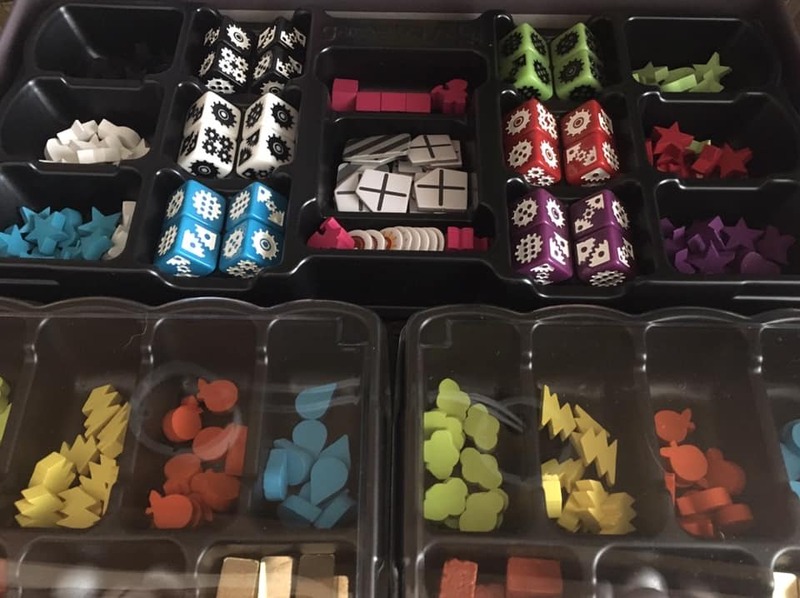 One of the earliest variants proposed by a fan–one that ended up in the Euphoria rulebook as a variant because it made so much sense–was about the “doubles rule.” At the beginning of your turn, if you have multiple worker dice in your personal supply that show the same number, the are both eligible to be placed on a single turn. 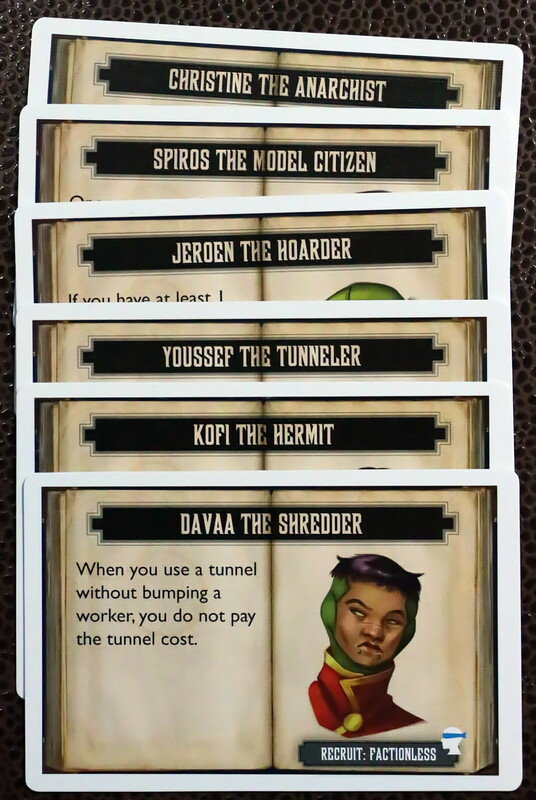 The change we’ve implemented is that for each worker beyond the first (it’s possible to have as many as four of a kind), you can only place them on the same turn if you pay 1 morale each. This gives more meaning to morale than just your card limit, and it reigns in lucky players a bit (while still making them feel lucky when they roll doubles). In the past, you could only place a star on a constructed market (post-construction) by going to the nearby artifact market. 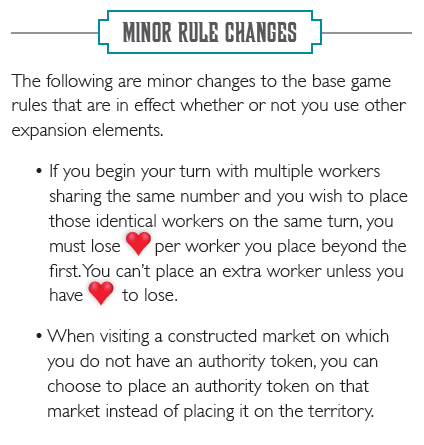 Now you can also do the thing players have probably been accidentally doing for years: You can place a worker on the constructed market itself, pay the cost of using that market, and place a star on that market (or on the nearby territory as normal). We also added a double-sided reference card to be placed on the board: One side for ongoing rule reminders and the other for setup reminders. This is the last design diary post, and if all goes well, the preorder will proceed as planned next Wednesday. The uncertainty stems from freight shipping–apparently the incoming containers are held up at port in Tacoma, so, we’re waiting to see if they will be delivered on time. If not, I’ll either change the pre-order date or I’ll just adjust the estimated fulfillment dates. I’ll let you know the plan next week either way. 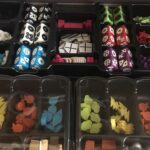 Tomorrow is the full rulebook reveal, but today I’d like to share the story behind one of the new setup rules (and an optional, related component). This change was actually mentioned on the February 9 design diary about addressing the “Icarite problem.” One of the solutions is that when you play with the expansion, in 2-3-4 player games, the miner meeples start 3-2-1 spaces down the tunnels. This means that it’s easier to activate recruits of the earthbound factions, which alleviates the issue that it was easier to activate additional Icarite recruits. It also makes the tunnels more appealing than before, especially since they’re that much closer to unlocking the precious final space of each tunnel. 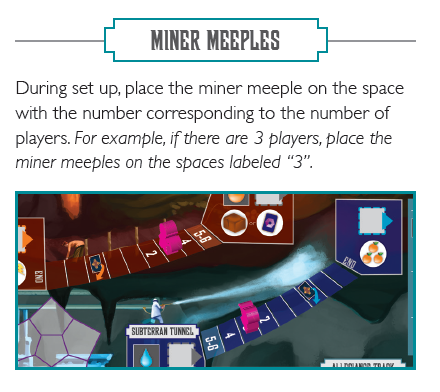 You can just refer to the rulebook during setup to show you where the miner meeples start. 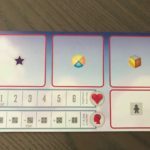 You can apply the corresponding stickers (included in the expansion) to your board. 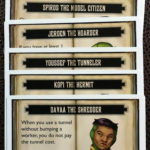 The tunnel shapes have very slightly changed depending on the printing, so we included all possible sticker options. You can buy a special version of the board that we’ve printed for the pre-order. 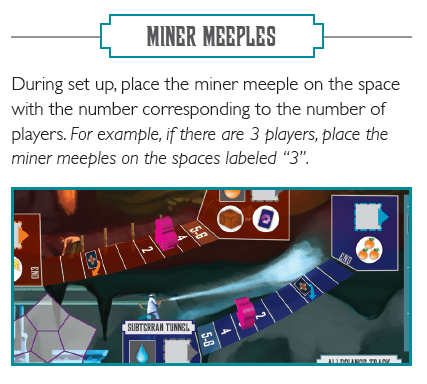 This board is specifically designed for use with the expansion, which basically just means it has the miner meeple starting positions printed on it, as well as the expansion reference key. 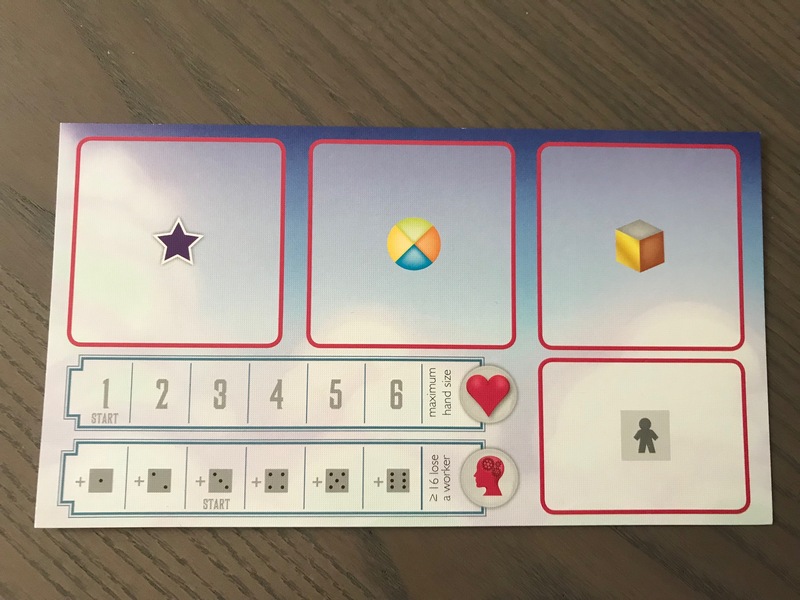 While those rules can be used in the original game, they are not officially in that game, hence why the original board does not have those numbers or this version of the reference key printed on it. I’ll see you tomorrow for the final design diary post! 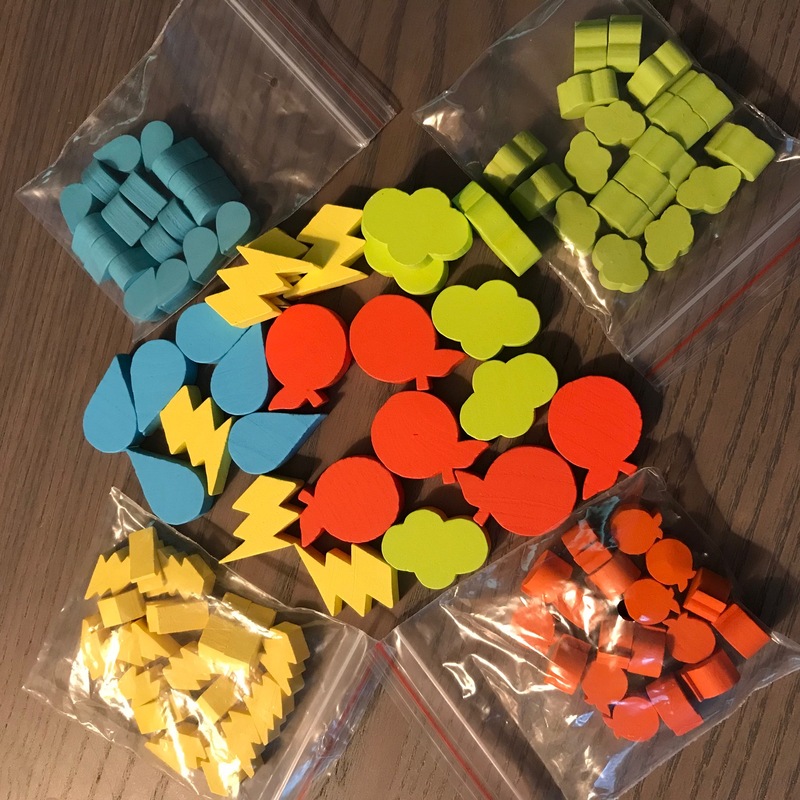 As we near the end of these design diaries, I wanted to talk about a subject that is indirectly related to the expansion: Game Trayz. 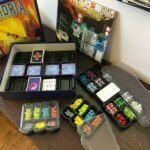 Earlier this year, when the latest printing of Euphoria was entering production, Noah at Game Trayz approached me about an idea: He was moving away from manufacturing trays himself and selling them directly (as he had for Euphoria in the past), and was instead focusing on (a) working directly with publishers (as he did for Wingspan, My Little Scythe, and Between Two Castles of Mad King Ludwig) and (b) selling trays through the Geek Store. Noah suggested that if it wasn’t too late, we could include the tray in the reprint of Euphoria. He offered to make some updates to the tray (the original was great, but Noah’s learned a lot about 3D modeling and tray functionality over the last few years). 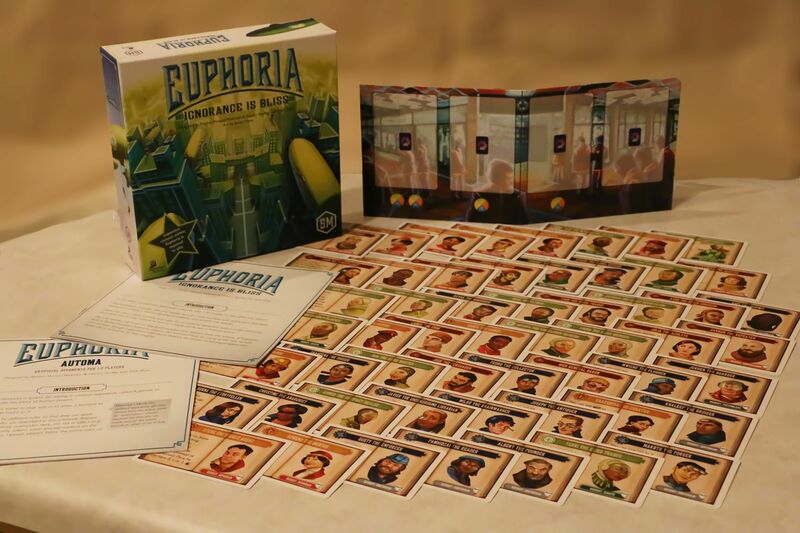 Other than the addition of the tray, the latest printing of Euphoria is the same as the previous printing. 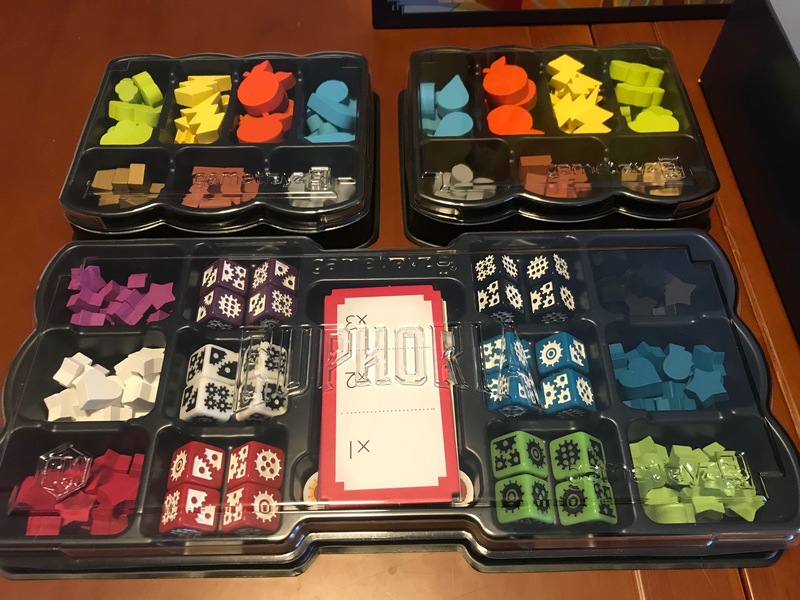 We decided not to increase the MSRP despite the added component cost, as it felt like the right thing to do (and the least confusing for retailers and distributors). We did, however, change the SKU to STM206 so you can tell the difference when looking at a Euphoria box at your local game store. Please note that if you have the original Euphoria tray, you definitely do not need the new tray. While there are some tiny differences, Noah designed the original tray in 2014 with extra compartments to leave room for hypothetical future components. It only took us 5 years to create those components! 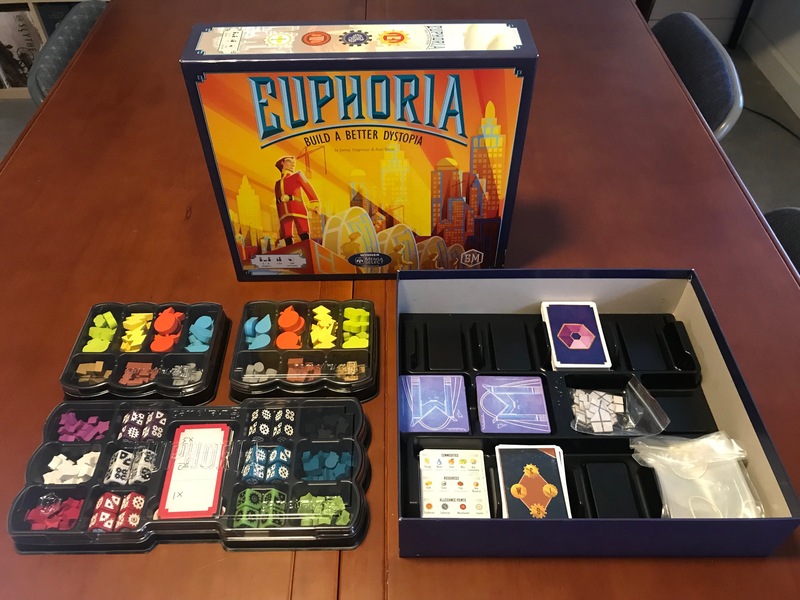 If you buy Euphoria from our webstore now, during the pre-order period (Feb 27 – Mar 2), or in the future, the game will include the trays inside the box. 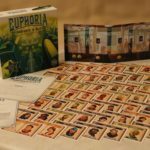 If you buy Euphoria from a retailer starting in April, if it is STM206 (see back of box), it has the trays inside the box. If you already own Euphoria, you can buy the tray from the Geek Store. I understand that’s not ideal for people who live outside the US, but perhaps you can arrange a group purchase. 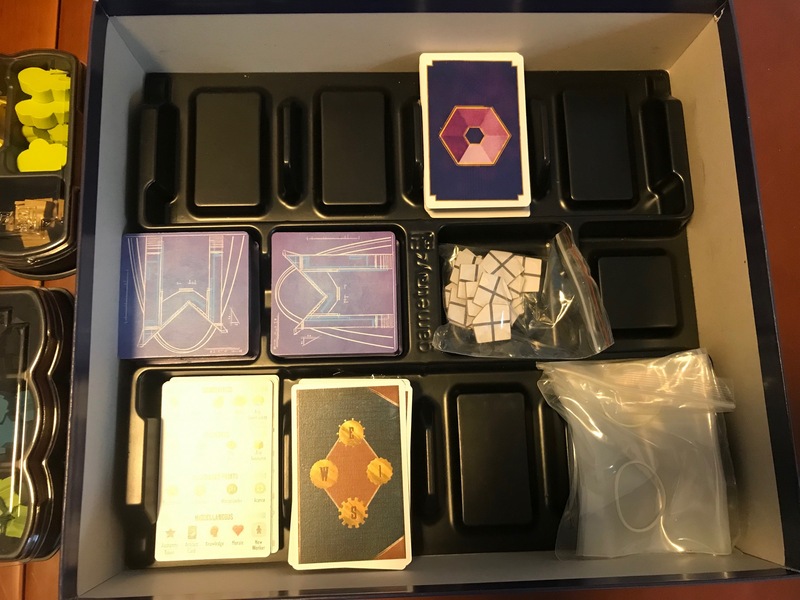 While I don’t have trays to sell, I have a very small number for replacement parts and for situations where someone thought they were buying a copy of the game with the trays (but it was actually an older printing). As you can see from the photos, the expansion components fit into the trays–there’s even room to spare in the bottom tray. We have heard from exactly 1 person that they struggled to get the new tray into their original Euphoria box. I’m not sure why, as the boxes are all the same size, but if this happens to you, trimming the bottom edge of the tray with scissors solves the problem. Also, happy birthday to Noah! He lives here in St. Louis, and I attended part of his weekend-long birthday party yesterday. 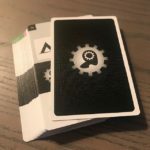 Today’s design diary update is a continuation of the February 14 post about the Automa design…and how it’s not just for solo play (optionally). Thanks to Morten for writing this! 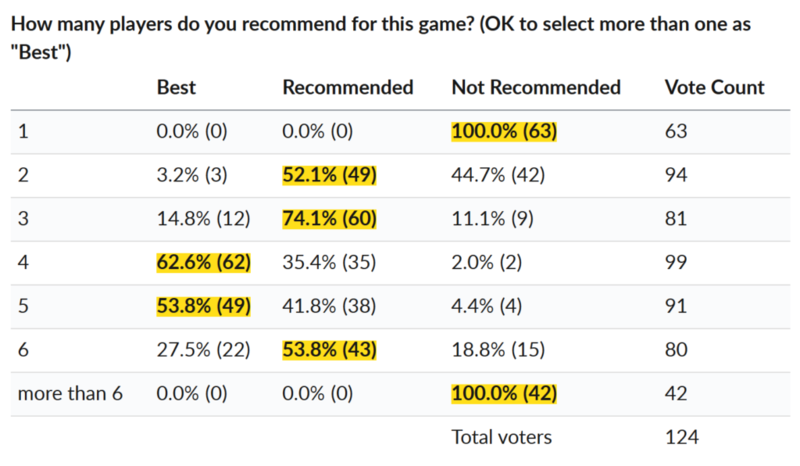 So, while Euphoria supports 2 players and while Jamey takes great pain to support all player counts equally it’s clear that 2-player is significantly less popular than all other player counts and almost half of the voters don’t recommend playing that way. We took this to heart when designing our solo mode, but before I get to that let me briefly explain how our solo modes work. Our approach is to add artificial opponents called Automas that take the place of human players. They mimic the core interactions between players, but nothing else and they’re playing simplified versions of the games in order to make running them as easy as possible and make them competitive (most human players are more intelligent than a stack of cardboard). 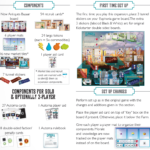 Normally we add one Automa thus creating solo modes that simulate 2-player games. But as said players think that Euphoria is better with higher player counts than that, so we decided to create a system that added 2 Automas thereby making solo a 3-player game. 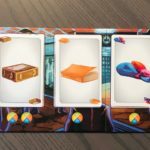 We could have added 3 Automas to get to the more popular 4-player, but there’s a trade-off: Each Automa adds to the workload of the player and we felt that 2 Automas struck the right balance between ideal player count and workload. 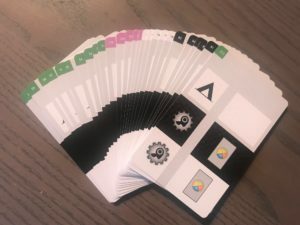 Taking a 1-player game beyond the 2-player count is all well and good for solo players, but it doesn’t address the actual 2-player game, so we decided that our Automa system should be available when playing with 2 humans and so with the expansion you can now play as if you were playing a 4-player game. This moves the game to the most popular player count for those that prefer that. 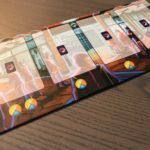 Allowing the Automa system to be used with 3 humans was an option we considered because it would move the game to the more popular 5-player, but again we faced a trade-off decision. At 5 players the Automas can into trouble with the constructed markets. It wasn’t anything we couldn’t have handled (and you can house rule it if you want), but it would have required us to add exceptions to the subsystem that’s by far the most complex in the Automa rules. An alternative would be to the reduce the number of Automa players from 2 to 1, but that would also require extra explanations in the rules. 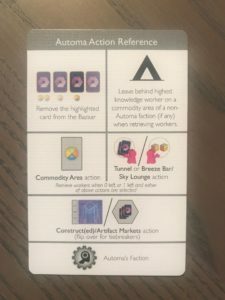 We think that the limited potential benefit of the move from 3 to 5 players wasn’t worth the rules and workload overhead of using the Automa system and no matter how well we make the Automas they’re never 1 to 1 replacements of human players. It’s our experience that adding artificial opponents is not popular among those who play with 3+ players, so we didn’t want to add rules that got in the way of the audience we were aiming at to create a dubious benefit for players that likely wouldn’t be interested anyway. This is Jamey again. 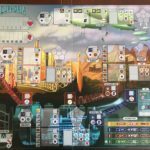 With Morten’s Automa story fully revealed, it’s time to share the full Automa rulebook! One of the defining components in Euphoria are the recruit cards. These are your asymmetric abilities, the special powers that make you unique. They also determine which faction’s engine-building elements you’ll benefit from as the corresponding allegiance track advances. 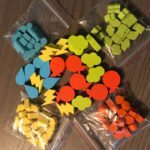 We love engaging fans of our games in the creative process, so one of the first things Morten and David did was to request ideas for recruits (and markets) on BoardGameGeek. Many of these ended up serving as inspiration for the final designs and/or names, and Morten rewarded the top contributors with custom art. However, one of the reasons we’ve moved away from custom art is that we want the control to feature a wide diversity of people in our games (especially when it makes sense for the theme, as it does in Euphoria). You’ll see that reflected in the final cards–there’s a great mix of men and women, different ethnicities, different ages, etc. As I mentioned in regards to the markets, if you play with the new recruits and new markets, you won’t play with the original recruits and markets (you’ll choose one set or the other). This is mostly for balance reasons. You may have noticed a hint in a previous design diary post about the “factionless recruits.” I absolutely love this concept (I’m not sure if it was Morten or David or someone else who thought of it). There are 6 new recruits that aren’t associated with any factions (and thus don’t give you benefits from the allegiance track) because their abilities are so good! Two of them came out in the 6-player game I played on Wednesday, and they had a big impact. Importantly, though, you can only ever have at most 1 factionless recruit, and if you do, they are immediately active (because there’s no way to flip recruits if they don’t have a faction). I look forward to hearing your thoughts on the new recruits when you get to play with them in a few weeks! Do you see any recruit names you’re curious about in these photos? Thanks to Kim Euker for taking the fancy photos. 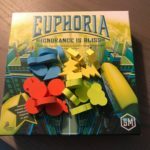 Euphoria: Ignorance Is Bliss is breaking new ground for Stonemaier Games, as it’s the first expansion to add an Automa solo play option where the entire expansion is designed by the solo designers. I invited Morten to share his thoughts, and I’ll break it up into two parts: Today I’ll share his post about the solo mode, and in a few days I’ll talk about how and why Automa can optionally be used at another player count (I’ll post the Automa rulebook then). 6 out of 8 of our games have solo modes using our “Automa” artificial players. 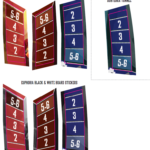 The remaining 2 are of course a blemish on our track record, so we’ve used Ignorance is Bliss to close half that gap by including a solo mode for Euphoria. While it’ll be the seventh Stonemaier solo mode published it actually started development just after the first one we made (Viticulture), but it was repeatedly overtaken by other projects. The upshot of that is that we’ve learned a lot in the meantime and have applied that to make the version that is in the Ignorance is Bliss box. 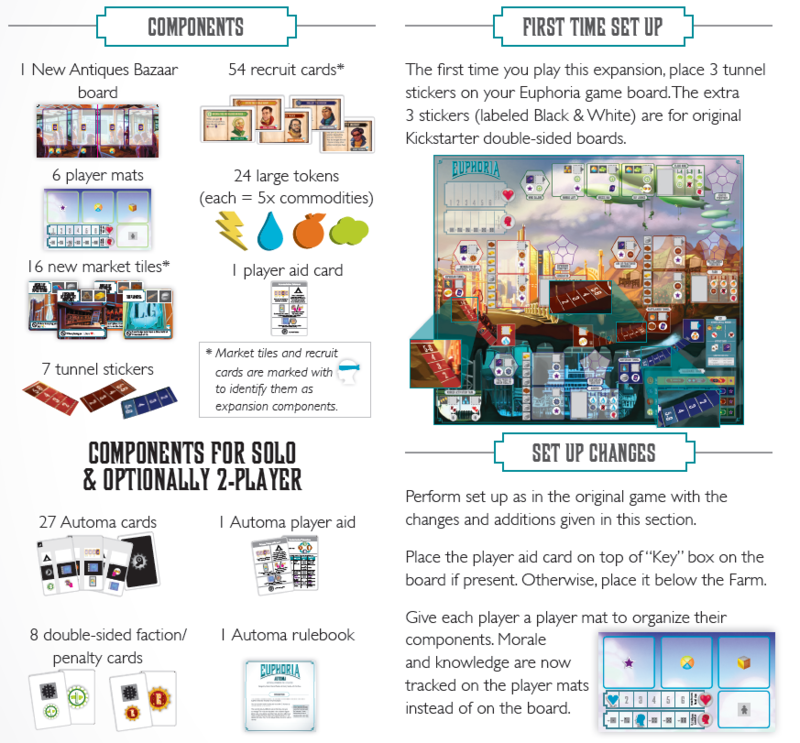 The Viticulture Automa was very simple and for Euphoria we wanted to take things a step further. First, we simply handed the Viticulture Automa all its victory points from the beginning (with an exception in the Tuscany expansion) and for the dual Automas in Euphoria we wanted them to gain victory points (place authority tokens) based on their placement of workers on the board as well as from their almost non-existent recruits and from the allegiance tracks like human players do. Just as important, the Automa in Viticulture is an almost one-way affair where the Automa blocks the human player, but the human player can only affect the Automa in one subsystem of the Tuscany expansion. This runs counter to the main tenet of the design philosophy we developed later: The core interactions between players should be mimicked when playing against an Automa. The Automas get penalized for not being a part of constructing a market (though in a very simple manner). The Automas gain a benefit from getting recruits activated (but not from the recruit abilities, since that’s an uncommon interaction point). The Automas place an authority token when the end of “their” allegiance track is reached. The Automas get the same advantage from being bumped as human players. There’s one interaction that we’re leaving out, though, and that’s filling up territories, so that others can’t place authority tokens there. 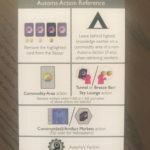 Getting the Automas to adapt to territories being filled up required extra rules in the subsystem that’s by far the most complex and we felt that this interaction isn’t important enough to make up for that. Trade-off decisions like that are core to our work on Automas, because we want them to mimic all interactions perfectly, but we also want Automas that don’t crush the fun under the workload of handling them and we want a low barrier to entry that allows most players to enjoy them. 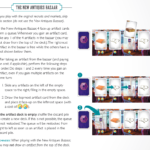 Getting those trade-offs right takes up a major part of our design time, because we try and try and try (and try) to express the interactions with as few and as streamlined rules as possible – and believe me that’s pretty darn hard! 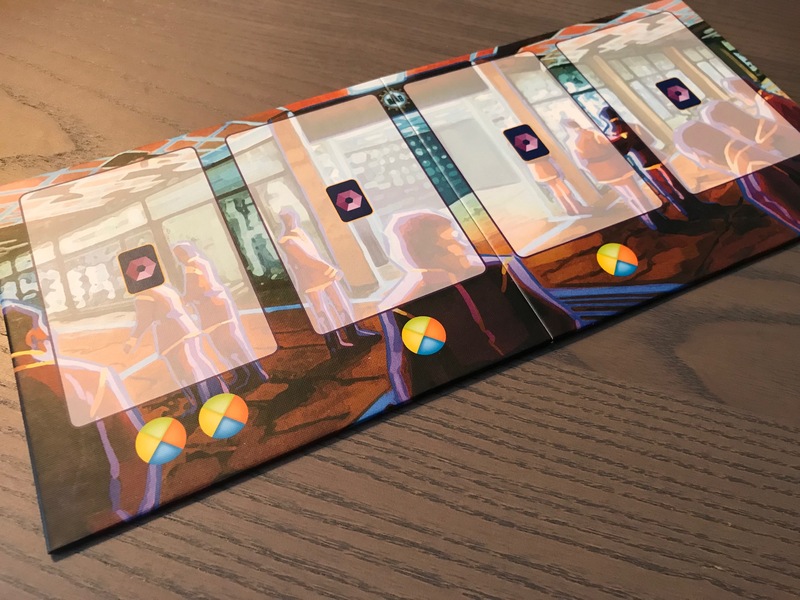 There’s a little design philosophy I’ve picked up over the last few years since designing Euphoria: When tracking information (i.e., on an actual track), if players need to compare themselves to each other, put a shared track on the board. If players don’t need to compare their status, put individual tracks on player mats. That isn’t what we did in Euphoria, of course. Players adjust morale and knowledge on shared tracks on the board even though they don’t compare that information to each other. The result is a lot of reaching across the board or assigning one player to be in charge of it. So we decided to add player mats to the expansion. 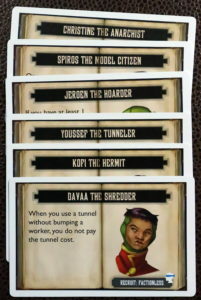 As you can see from the photos, each player mat is color coded and includes morale and knowledge tracks. 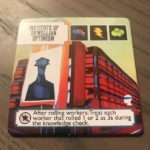 There’s also a place for stars, commodities, resources, and workers, which makes it easier for you to sort that information and easier for other players to see what you have at any given time. We did play around with the idea of making asymmetric mats (we tried a bunch of different methods, including individual asymmetry and a type of meta-faction asymmetry), but we just weren’t satisfied with the balance, so we just made them all functionally the same. I’ve noticed that some people see thin player mats and immediately assume the publisher was being cheap. 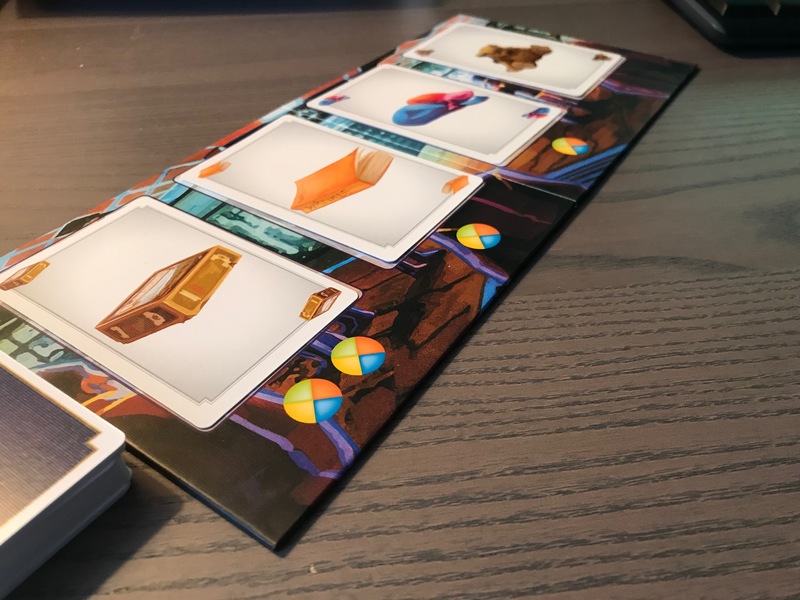 However, there is a specific reason why we’ve used 400gsm linen cardstock for this expansion and My Little Scythe, and it has nothing to do with cost: This thinner cardstock doesn’t warp. With thicker cardboard, it’s simply inevitable that it will warp in certain climates and conditions (it’s even worse with dual-layered mat because of the expanding and contracting state of the glue between the layers). So rather than put gathers through the strife of warped cardboard, we’ve pivoted to 400gsm linen cardstock, which is still quite durable. 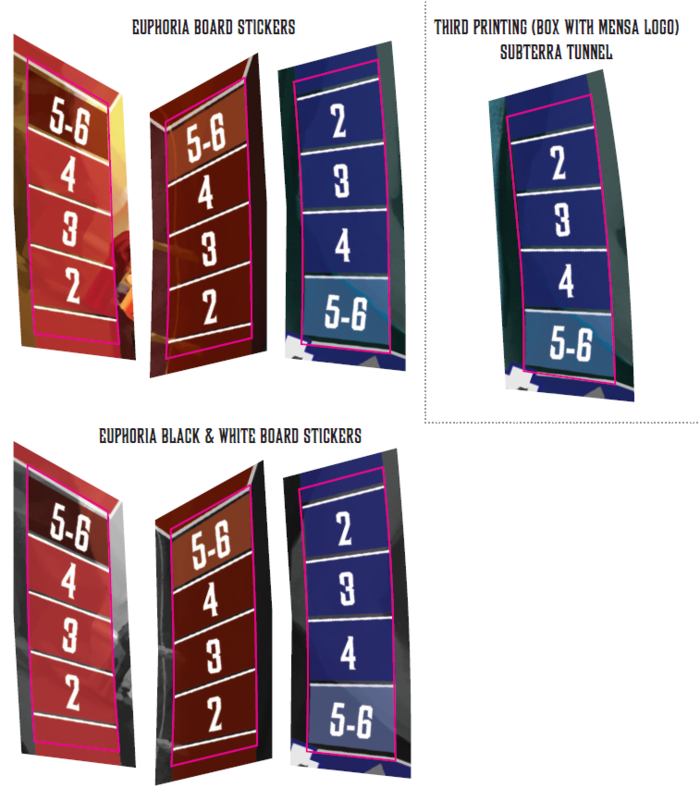 Which player mat color will you be claiming in a few weeks when we ship Euphoria: Ignorance Is Bliss to you? 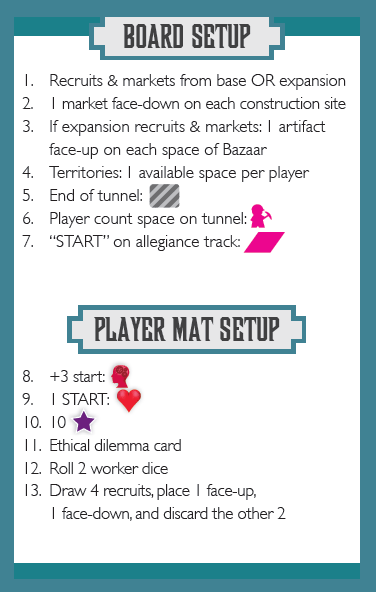 One of my favorite moments in playtesting any of my games involved the market tiles in Euphoria. It was early 2013, and Euphoria had gone through several iterations at that point. In the most recent build, I had added these face-down tiles that any player could spend multiple turns and multiple resources building…or they could encourage other players to help them out. Players who are left out of construction are forced to play around an ongoing dystopian-style penalty that may or may not impact their strategy (they can get out of it later if they choose). Thus the constructed market system was born! The expansion adds 16 new market tiles that are not meant to be shuffled in with the original tiles (you’ll either play with the original recruits and markets OR the new recruits and markets). 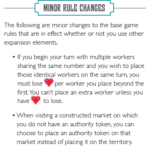 The expansion also slightly changes a rule about how you can place a star on a constructed market without your star (i.e., to get out of the ongoing penalty). 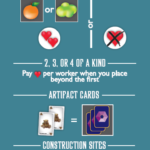 Previously, you could only only do this by visiting the nearby artifact market, but now you can also place a worker on the constructed market itself and pay its cost. Big thanks to everyone who inspired these new market designs/names and to Morten, David, and Nick for making them as balanced and clear as possible. Which of these–by name only–would you most like to visit? In today’s design diary post, let’s talk about designers and jumbo commodities. You may have noticed that I (Jamey) am not the designer of the expansion. That may seem a bit odd, as I designed the original game of Euphoria. Didn’t I have ideas for ways to expand it? 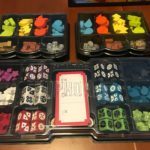 However, as is the case for many of my games, I put everything into the core game (everything worth having). I was plum out of ideas, but people were asking for an expansion. 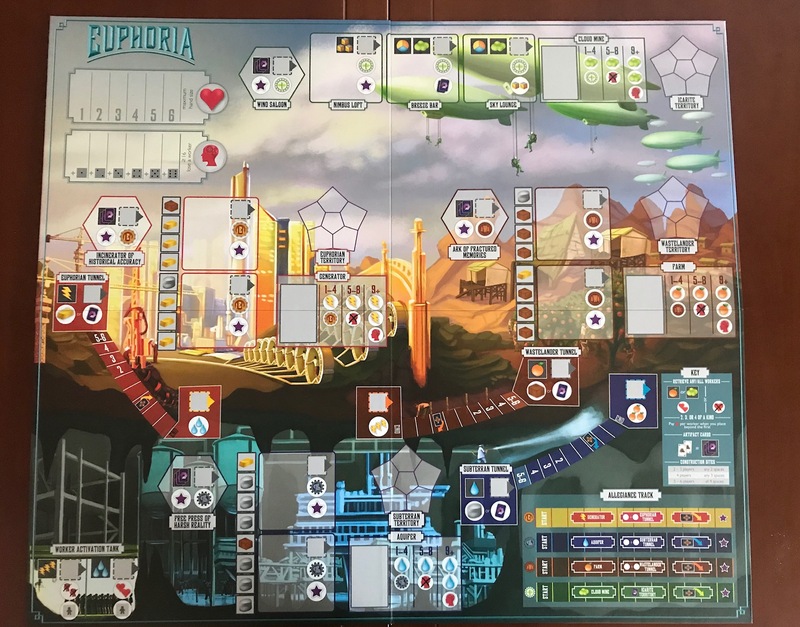 So I think it was 2015 when I turned to Morten, who creates the Automa (solo) versions of our games, and asked if he wanted to design the Euphoria expansion. He brought on David, who has worked with him on a number of Automas, and they got to work on it. They eventually also worked closely with Nick Shaw. Perhaps I’ll go into detail in a future post about what happened over the next 4 years, but in short, it was an interesting journey. I think Morten and David learned a lot about designing an expansion from scratch, and I learned a lot about serving as a developer/publisher for a project I commissioned. The process led us to versions of the expansion that looked and played wildly different than the final product. 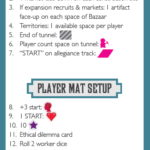 But in the end, the version that resonated best with playtesters was the version we decided to use: alternative recruits and markets, some fixes to perceived issues, and some additions. Because I wasn’t intimately involved in the design process, my focus was more on the components and presentation of Ignorance Is Bliss. Most of the expansion is cardboard (cards, tiles, mats, and the board), so I wanted to add something a little more dramatic without significantly increasing the cost. 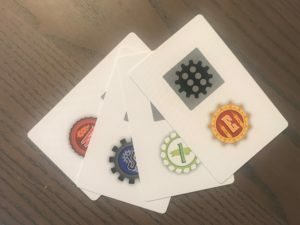 I decided on jumbo commodity tokens. 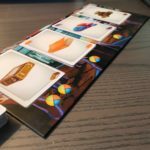 One small issue in Euphoria is sometimes players run out of commodity tokens, as they’re easy to collect and hoard. Now, with the expansion, you can use a jumbo commodity token to represent 5 of that commodity (or 3 or 4 or 10–the multiplier can be anything you want). We included 6 of each token. Thank you to Morten, David, and Nick for designing this expansion! I really appreciate the time and creativity you put into bringing it to life. It’s Sunday, so I’ll keep this update brief! You’ll continue getting information about Euphoria: Ignorance Is Bliss from me over the next 7-10 days (by which point you’ll know pretty much everything about the expansion). 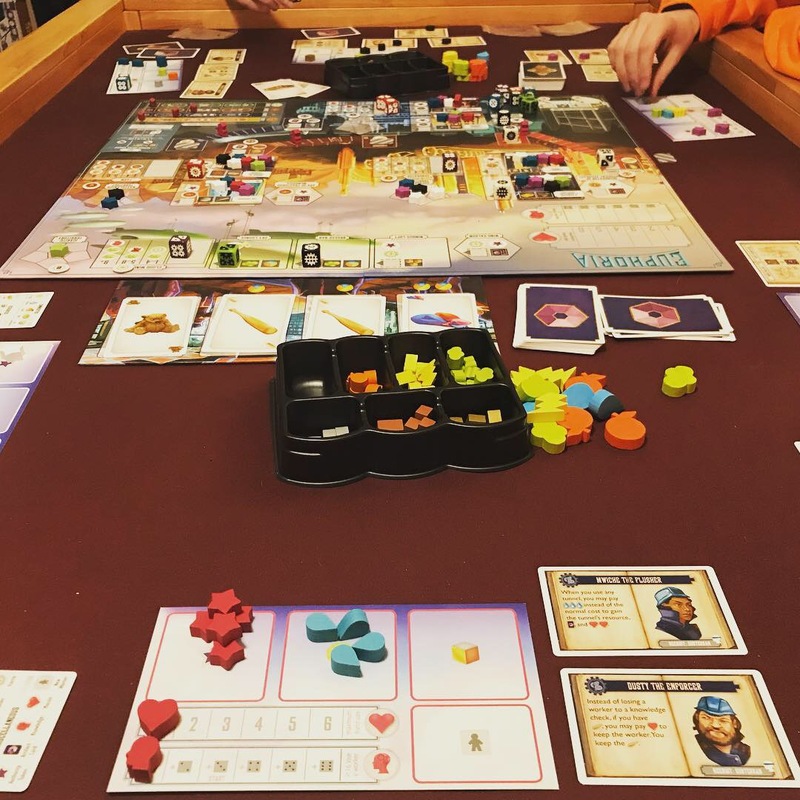 After that, you’ll start to see photos of the expansion appear on social media on February 20–these photos are taken by reviewers who received advance copies of the expansion. On February 27, when preorders go live, those advance reviewers will start to share their opinions of the expansion so you can make an informed decision. The reason those reviewers have an embargo date is so that none of them feel like they have to rush out a review to be the first–they all have time to play the expansion a few times and offer their unbiased perspective. If you don’t see your favorite reviewer on February 27, don’t worry–we get a very small number of advance copies, and we’ll be sending out more review copies when the main shipment arrives. For now, though, I wanted to introduce you to The Mill, a Stonemaier-focused YouTube channel run by Dusty Craine. Dusty posts once a week, and in yesterday’s video he recapped all of the information available for the expansion so far. One of the perceived issues with Euphoria is The Icarite Problem. There are some strategies that revolve around primarily using actions in Icarus that led to players selecting more Icarite recruits than other recruits, which led to the Icarite allegiance track advancing faster than other tracks. We discussed this issue in great detail and approached it in different ways with various versions of the expansion. In the end, we decided that we wanted to retain the feel of the original game, as one of the things that make the Icarites fun is that they’re a little different than the other 3 factions. 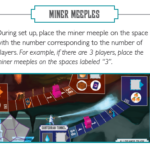 In 2-3-4 player games, the miner meeples start 3-2-1 spaces down the tunnel. This means that it’s easier to activate recruits of the earthbound factions, which alleviates the issue that it was easier to activate additional Icarite recruits. 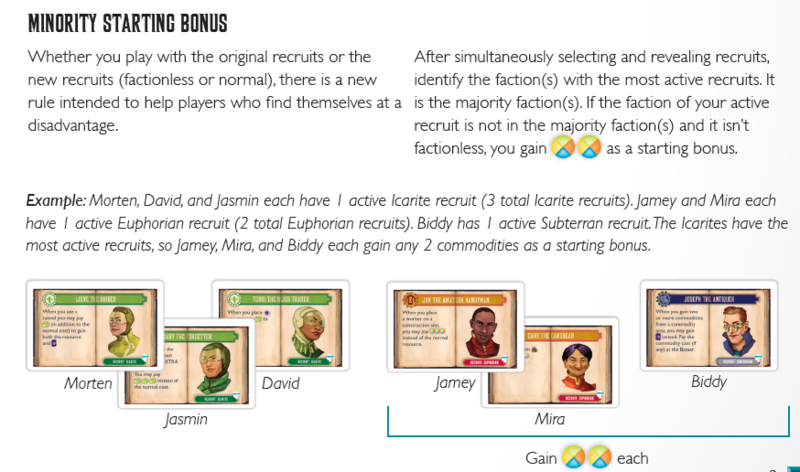 Also during setup, we’ve implemented something called a “minority starting bonus,” which refers to the recruit each player reveals at the beginning of the game. After that reveal, players will identify the faction(s) with the most active recruits. That’s the “majority faction.” If the faction of your starting active recruit is not in the majority faction(s), you gain any 2 commodities as a starting bonus. Thus, if Icarite recruits are preferred, the minority faction commodity bonus given during setup should help the earthbound factions. They’re little tweaks, but sometimes a little adjustment can make a big difference! 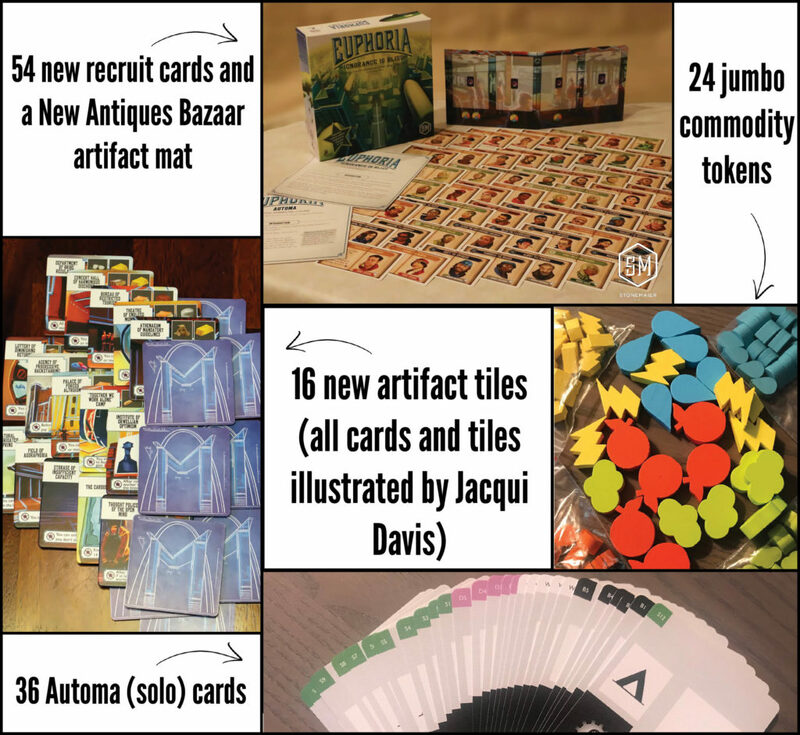 The New Antiques Bazaar is one of the biggest additions to Euphoria in the expansion, so today I’m going to share exactly what it is and how it works. This is one of the original ideas David thought of several years ago, and despite dramatic changes to the expansion over that time, the Bazaar remained a favorite among playtesters. In the original game, there are a few ways player can draw artifact cards. It’s a random draw from the top of the deck. These cards could be spent at various markets (Icarite, artifact, and some constructed markets). The type of card often mattered, whether it’s using a pair of artifacts instead of any 3 artifact cards, a specific artifact on a constructed market, or a specific artifact on your ethical dilemma card. 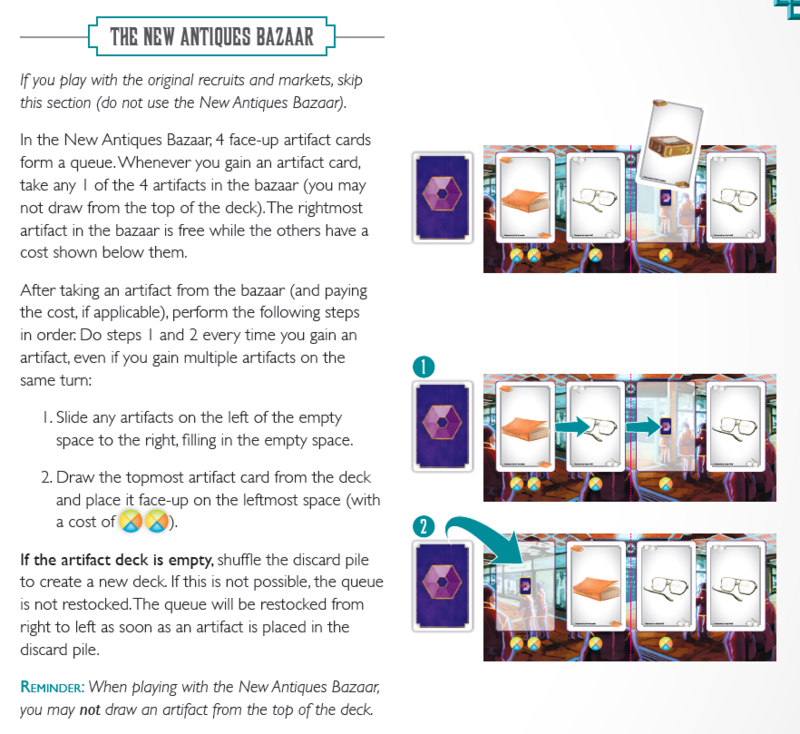 So to give players more agency over which artifact cards they drew, David designed the New Antiques Bazaar. It’s a mat that sits next to the board, populated with 4 face-up cards at all times. 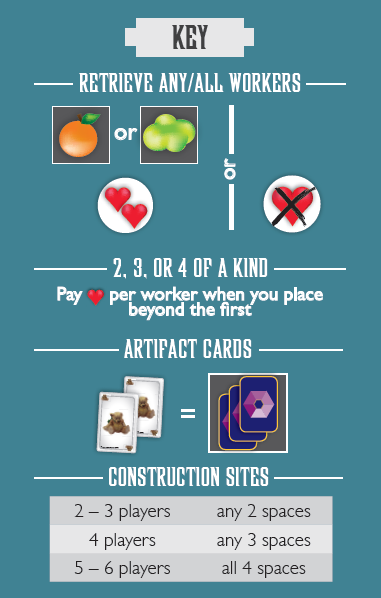 The artifact on the far right has no additional cost (beyond what you paid–if anything–to place your worker on the board), while the others have additional costs of 1 or 2 commodities. Whenever you select an artifact card, the cards immediately slide to the right to cover the empty slot, and a new card is revealed from the top of the deck. Players can’t ever draw from the top of the deck. I love how the New Antiques Bazaar takes a blind draw and adds player choice to it, especially for content that you can easily see no matter where you’re sitting at the table. I also like that David chose a presentation method that didn’t require players to remember anything. Okay, let’s get right down to it: What exactly IS this expansion? Ignorance Is Bliss is a “more stuff” expansion. 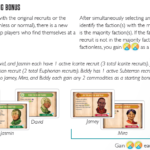 Or perhaps a better way of putting it is “alternative stuff.” For example, there are a bunch of new recruit cards and market tiles that you can use as an alternative to the recruits and markets in the original game (they aren’t designed to be mixed together with the original recruits and markets). There’s also a new type of recruit card (not a new faction, just a new type) that I’m excited to share soon. I look forward to sharing the details of those elements with you over the next week or so, and for now, here’s are a few images of examples of each of those categories the expansion occupies. Which of these categories most intrigues you (for Euphoria and for expansions in general)? Copyright 2019 Stonemaier LLC. 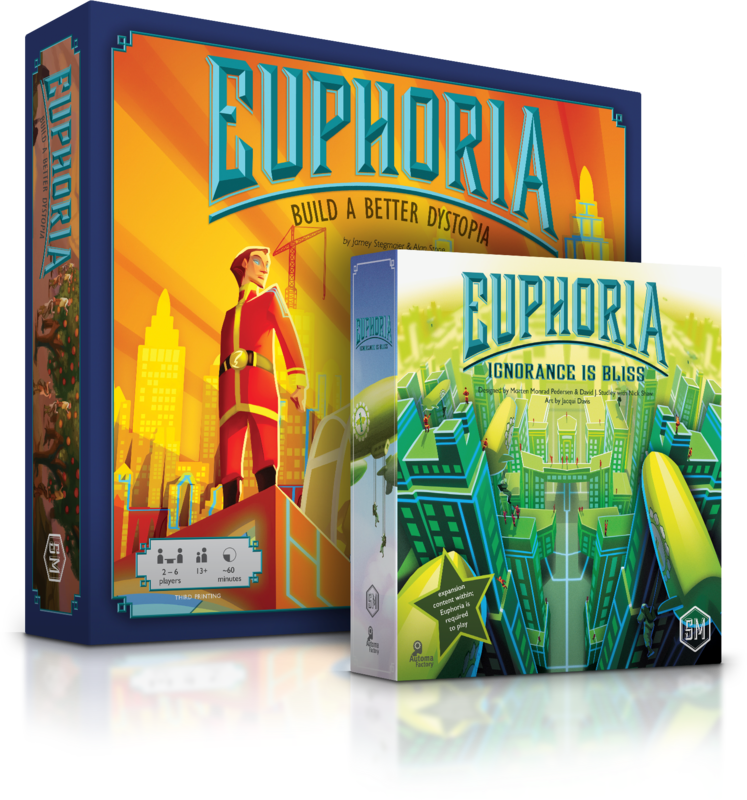 Euphoria: Build a Better Dystopia is a trademark of Stonemaier LLC. All Rights Reserved. This content is not authorized for posting on Steam. so very excited for this. Still love this game, and hope it breathes new life into the game the way tuscany did to viticulture. Super pumped about this. 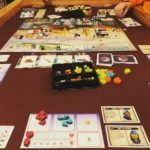 I just got Euphoria back on the table a couple weeks ago and was reminded of how much I like it. Joined Champions for this! 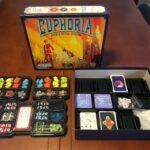 I became a fan of board games with my purchase of Euphoria. I am in when it is ready to go. I also joined the Champions half for this and half for the way the Wingspan pre-order was handled. There’s only so much that saying “Thank you” repeatedly can do, so it was time to put my money where my mouth was. My hope … my real hope … is that I won’t need both boxes to store the whole game. In fact, I’m hoping to use the Expansion box simply because … my cat ruined my old box. Nothing in the box was ruined, and I know boxes are one of the most expensive components to create, so no need to ask for a replacement. But this is my hope. Thanks, Gabriel! I have good news and bad news: The good news is that all of the expansion components fit into the core game box. The bad news is that the expansion box is much smaller than the core game box, so the Euphoria components won’t fit into the expansion box. Quick question for the designers (which you can maybe field to them and back). Why is the Bazaar not used when playing with the original markets and recruits. I could understand how you MUST play with the bazaar when using the new stuff (they have direct affects on the bazaar board), but not the other way around. Would love to know the design behind this. Sure, we talk about it on the design diary on this page. You CAN use the Bazaar with the original recruits and markets, but some of those recruits and markets will be imbalanced as the result of players being able to see some artifact cards instead of drawing blindly from the deck. Jamey, at this point, can you tell us if there will be a worldwide distribution and how soon or late? Specifically for non-english speaking countries, like here in Brazil, where we had the base game in partnership with a local publisher? Thank you and keep the great work! We always have worldwide distribution, but you’re asking about localization, right? We typically leave it to our localization partners to announce that, so I’d recommend asking them, though in this case none of them have asked to make the expansion. Sweet, looking forward to this! Just introduced the game to some new players last week and we had a great time. Coming back around to the game after a while, I realized that I hadn’t picked up the replacement recruits. Any chance we can order the replacements along with the expansion to have them shipped together? Thanks, Daryl! I appreciate you sharing Euphoria with others. As for the replacement recruits, that’s a great question, though I think the best place to get them is the BGG store. I might have a spare pack or two, but we haven’t had a decent supply of them in a while (definitely not enough for our fulfillment center to stock them). I should note that when you play with the expansion recruits, it’s a separate deck–you won’t use the original recruits then. 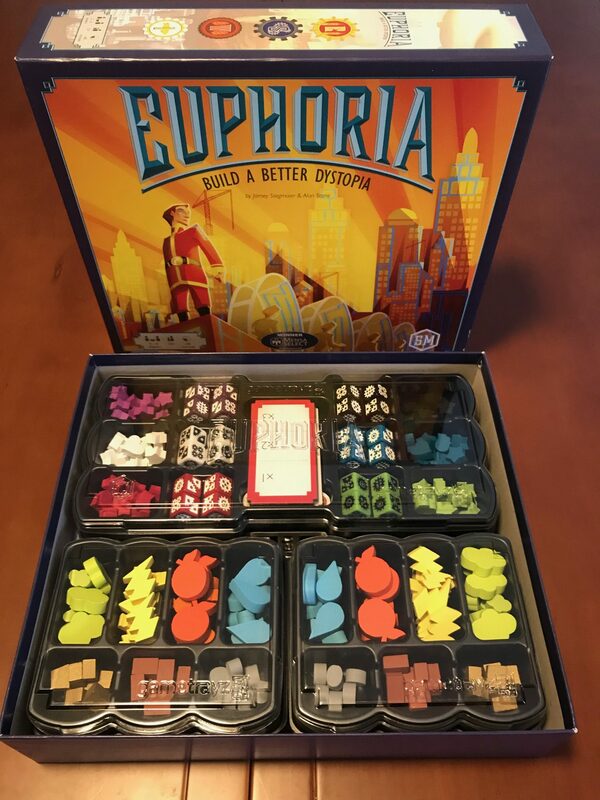 If I get this expansion, since it has the commodity tokens, does this mean that, when I combine it with a regular retail version of Euphoria base game, I can potentially have exactly the same components as the original kickstarter? Peter: The commodity tokens are actually in every copy of Euphoria. The new thing in the expansion is that there are jumbo commodity tokens. I think you’re thinking of the realistic resource tokens (gold, stone, and brick), which were only in the Kickstarter version. 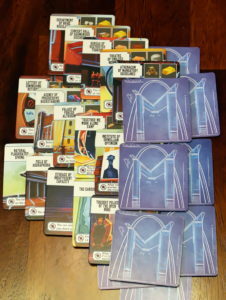 However, we make and sell similar versions of those tokens through Top Shelf Gamer. ah ok. I guess this is to mean there’s no “jumbo” versions of the gold/brick/stones then? That’s correct. While it’s common to accumulate commodities (and sometimes run out), players rarely have more than a few resources in their supply. 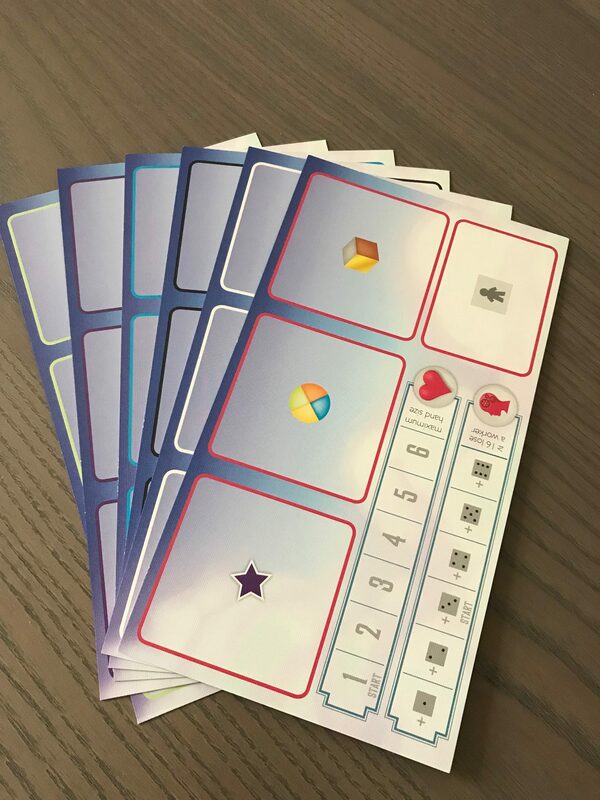 So are these “jumbo” commodity tokens bigger than the commodity tokens from the original game, or the same? I also would like a french version to play with my kids. But I also sort of like the idea that they will want to learn english to play my games. It will give incentive to study it. And later, it might be a pleasure to continue to maintain at least a basic understanding of the language. Thus, I have mixed feelings about it. It’s a wonderfull game, I love it. Thank you for all the great time we had playing it. Will you be getting more in stock soon? Steve: We only had a few sets, but if you put your email for a back-in-stock notification on that product, we’ll let you know when we have more. Actually, I know we have more somewhere among the replacement parts, so I’ve added some more. Awesome! Order placed along with the expansion. Helping Tom (slickerdrips) with the Klingon subtitles I got an early look at it and it is a must have! Thanks Jamey! 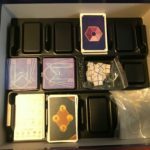 I backed the kickstarter for Euphoria, and have wanted to get the errata cards. Any chance those will be included in the expansion? Thanks! Ginger: They’re not included, as when you play with the expansion, you don’t use the original recruit cards at all. 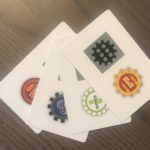 If you’d like to play with the original recruits and markets, the BGG Geek Store has some of those cards remaining. Okay, great. It sounds like the expansion will solve that problem. Glad to hear that it has been balanced as well! Thanks. Yes, I’m sorry about that. The picture should say Poland, but it says Portugal by mistake. The shipping rate for Portugal on the webstore is correct. Could you post a pdf copy of the rules for Euphoria: Ignornce is Bliss please? Yes, it’s been linked on this page (see the components list) for a few weeks. Jamey you are the best beast! i adore your constant willingness to interact with people. And i love the games you produce. PS – Right now i am happy with oppressive Orwellian Euphoria. But when you are done with “Wingspan”, can you please produce for me a toe to toe, 1 vs 1, bloodthirsty game with no remorse for the opponent please? Thank you. Played our first game with it tonight and I don’t think I’d ever play without it. First of all, my copy of Rise of Fenris arrived earlier this week and it has been everything I had hoped it would be. So thank you all for that! 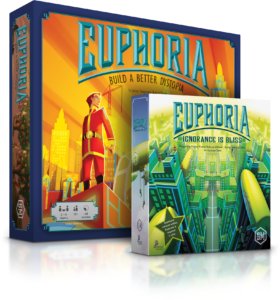 I love Euphoria…one of my earliest designer games…and I’m looking forward to purchasing and playing this expansion. 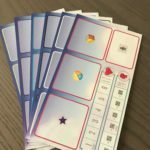 I have one caveat, however: I am a REAL klutz when it comes to placing stickers on a board…or on anything, for that matter…and I’ve read that the stickers in this expansion are very much a ‘one try only’ enterprise. If I screw it up…and, trust me, I will…then the beautiful board is going to be stuck (haha, see what I did there?) that way. Any suggestions? Any possibility of a removable sticker option? Can you come over and put the stickers on yourself? Thanks Kevin! I understand your concern. They’re not removable stickers, so I would say to try as best you can. If it doesn’t work out, we can always send a new board to you (the only version of the board we don’t have is the double-sided Kickstarter board). Good luck! If I screw it up in my usual fashion I’ll send you a picture so you can at least have a good laugh. Before sending me the (pre-stickered) replacement board, that is!